The AC joint is the joint located where the collar bone meets the should blade and arm bone (humerus). The clavicle meets the part of the collar bone known as the acromion, forming a socket where the humerus arm bone fits. The joint is held in place by several ligaments, the most important of which is the acromioclavicular ligament. How does AC Joint Separation Occur? An AC joint separation occurs whenever the joint between the clavicle and the acromion is damaged. It can be quite painful and inconvenient, but – despite common confusion to the contrary - it is not the same thing as a dislocated shoulder which involves the head of the humerus being forcibly removed from its socket. Most AC injuries are the result of a strong blow to the shoulder or elbow. They can also be the result of a heavy fall or landing onto the elbow or an outstretched hand. Contact sports and car accidents are common causes of AC joint separation injuries. What are the different levels or grades of AC Joint Separation? AC separations are graded according to severity on a scale from 1 to 6, with 6 being the most extreme and rare. Grade 6 injuries involve torn ligaments and a complete disruption of the bones, while grades 1 and 2 are the most common and also the easiest to recover from. What are the symptoms of an AC Joint Separation Injury? The primary symptom of an AC injury is notable pain at the moment of impact in the outer end of the clavicle, near the arm. You may also experience pain throughout the shoulder after impact, especially when trying to lift the arms above the shoulders. There is often swelling and bruising, and if quite severe, you will be able to discern a noticeable lump at the tip of the collarbone. How do you treat an AC Joint Separation? If you are diagnosed with a lower grade level of shoulder separation, the injury will heal on its own with gentle exercise a few weeks after the injury when the pain has subsided a bit. Gentle exercise with increase range of motion and minimize instances of “frozen shoulder,” a common secondary issue that involves uncomfortable should stiffness. It is also advisable to treat the area with intermittent cold therapy thorough the first week to reduce inflammation. Use ice or a proper cold therapy system on the joint for 15 minutes at a time, every 4 hours. NSAIDs such as ibuprofen will lessen pain and further reduce inflammation. Higher grade AC separation injuries will require a longer to recovery and should be overseen by a doctor or physiotherapist, who will be able to advice and supervise the recovery process. It is important to manage the pain, gradually resume activities, and eventually build up range of motion and muscle strength. 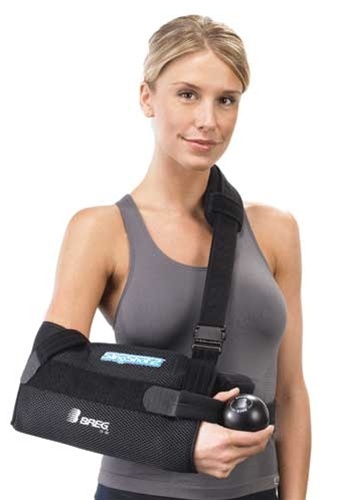 It is likely that you will don a sling or shoulder immobilizer to restrict movement, lessen the pain, and promote healing. The joint may also be taped to further restrict movement. Surgery will almost certainly be necessary for grades 4, 5 and 6 shoulder separations, but these are instances of injury are quite rare. About MMAR Medical: MMAR Medical Group Inc. is one of North America's premiere medical orthopedic brace distributors, carrying a large selection of carpal tunnel braces and rehabilitative cold therapy units. Based in Houston Texas, MMAR also carries a back brace and unloader knee brace selection.